Easily add lifelike speech to your WordPress blog. 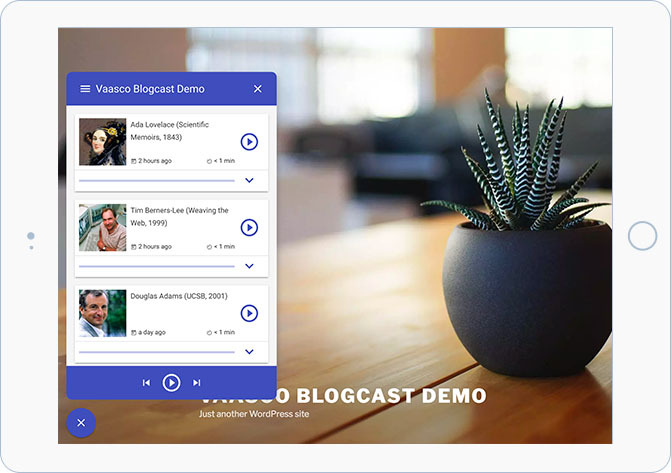 Introducing Vaasco BlogcastAUTOMATICALLY CONVERT YOUR WORDPRESS CATEGORIES AND POSTS TO PLAYLISTS AND AUDIO TRACKS. Vaasco Blogcast allows visitors listen to your content while driving, working out and in other handfree environments. It also makes your content accessible to users with visual impairments and motor disabilities. Vaasco Blogcast is powered by Polly, an Amazon AI service that uses advanced deep learning technologies to synthesize speech that sounds like a human voice. This results in high-quality voice output and word pronunciation. 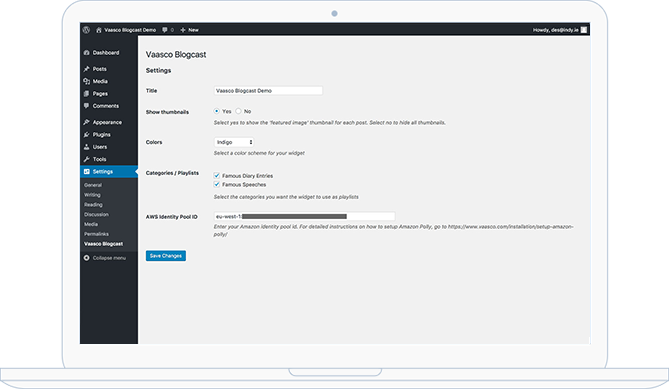 Simply install the Vaasco Blogcast WordPress plugin and add your Amazon Polly credentials to get started. Easily configure options such as widget theme and categories to use through the WordPress admin panel. Vassco Blogcast embeds a simple widget on your blog. This widget has a familiar interface allowing users to navigate playlists / categories and tracks / posts with ease. Style the Vaasco Blogcast widget to match your own blog theme. Set playlists and other options within the WordPress admin panel.